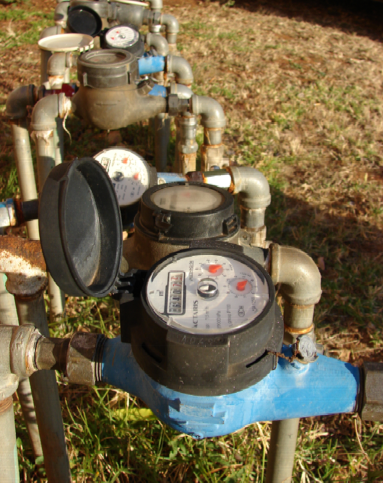 Athol Behr, the body corporate manager of Kenwyn on Sea in Ballito, shares his experience in deciding whether it’s a good idea to install individual water meters at the scheme. 2) The situation where a unit is only used by the owner during his annual vacation as opposed to a permanently occupied unit or one which is rented out continuously as holiday accommodation. The only answer is to install an individual water meter for each unit. Let’s look at a case in question. The average water bill for the whole complex during 2012/13 was R2500.00 per month with a sewage surcharge of (on average) R3000.00 per month. This results in an average bill of R120.00 per month per flat. Being an older building (just over 30 years) the majority of the flats need two water meters because of the water reticulation design. The quotation for installing individual meters amounted to R88 000.00 which would result in an average Special Levy of R1900.00 per flat. It is anyone’s guess as to how much (or little) the “seldom occupied” flats would save but even at a 50% saving it would take them nearly three years to recover their investment. Is installing individual water meters in the scenario mentioned worth it? What are your thoughts and experiences on this issue? In a future post Athol Behr will look at ways to conserve water within sectional title schemes, be it with one or multiple meters. Hi Andre, thanks for your question. We answer one question a day on our Facebook page for free. Please Like our Page on FB and re-post your question on our wall. One of our consultants should answer you within a few days. Thank you! Beatrice Guerra I totally agree with you. A property has a life expectancy greater than 50 years (100 years even) so if it takes 3 years to recover the investnent, you will have 47 to gain the rewards. In my opinion, even those first years you are already benefiting as you are no longer subsidising the beighbours. Its really frustrating doing your best to save water while your neighbours abuse more water and the water bill gets higher and higher while you know you are using water sparingly. What about sectional title stack units where the two units have to share water piping and thus the meter reading is applicable to both units on a 50/50 basis. Is this legal. HI Wilna yes you can call Prepaid Meters in JHB on 087 5500870 and tell them Mandy of PM2 in Cape Town referred you to them. 🙂 Thank you for your interest in the prepaid meters. We are in in a complex in Pretoria. Can you supply such meters here? Hi Wilna. Thanks for your comment. Paddocks is a specialist sectional title and home owners association firm (www.paddocks.co.za). We do online training for persons involved in ST and HOAs as well as provide support services such as consulting (www.paddocks.co.za/support/private-consulting) and membership to an online club where you can get fast answers to your ST or HOA questions (www.paddocksclub.co.za). We also sell books on the subjects (eg. http://www.paddocks.co.za/sectional-title-survival-manual). So unfortunately we cannot help you with the supply of water meters in Pretoria, but if you are interested in any of our other services or products please don’t hesitate to contact us. HI Athol. Firstly we sell SUB prepaid meters, so the supply still comes from city council and the free units are still allocated to the actual meters. The overcrowding: if you are one/2 people living in a flat and your neighbours total 5/8 or how many ever, you are paying for their usage in the end. The installations are about R550 per meter, depending on the remedial work to be done on the actual installation, but you get wall and ground meters. These meters work on a pricing scale, e.g. the more units you buy at once, the less you pay per meter. The monthly cost is around R15 per meter per month for Unipin (the service provider that generate the voucher numbers) and R30 for reporting and management to the Body Corporate or owners. The levies are loaded as arrears, e.g. 20% of the total purchase for water per month then goes towards the levies that are owed to the BC. For 1 building, we used to pay the council R1500-R3000 per month, now we pay them R6000 – R8000 per month, so it definitely works. I am a bit puzzled about your last line – used to spend R1500 to R3000, now R6′ to R8k. Is this supposed to be the other way round? Unless you are meaning those figures are your recoveries and therefore you are able to pay council more? HI Adri, yes. That is the amounts we are able to pay the council now. Mandy, your last sentence is quite correct with the emphasis on “many”, but that implies “not all”. The point I was trying to make is that sufficient and thorough investgation must be done before assuming that installing individual meters is the way to go. With regards to your example of “poorer blocks” being helped to collect levies, could you please explain how this works. I can understand recovering municipal accounts as each owner/tenant will be responsible for the payment of their water bill – no pay, no water. The fact that the “poorer blocks” have, in your words, 7/15 people living in one flat is not going to be solved by installing a water meter. That is another subject completely. Lastly, maybe you could give us some case study figures on a “before and after” basis where you have done an installation. The cost of installation and monthly (if any) fees will also help. We are the official resellers of Prepaid water meters in Cape Town and we definitely recommend the sub water meters. It is helping many poorer blocks recover levies and arrears on the municipal accounts. Overcrowding is a major problem and its not fair for one person in a unit to pay the next unit’s water with 7/15 people living in it. Water meters are the answer to many problems. This entry was posted on May 9, 2013 by Paddocks in Financial and tagged body corporate water bill, common water meter vs individual water meters, do individual water meters save money?, Individual water meters, sectional title property.